Most food blog posts are meant to inspire, but this one is meant to mock. Yes I am mocking you! When sour cherry season rolled around last June, did I, like you, stuff myself silly, popping every last sour cherry into my mouth until I had none left? No, sir, I did not. 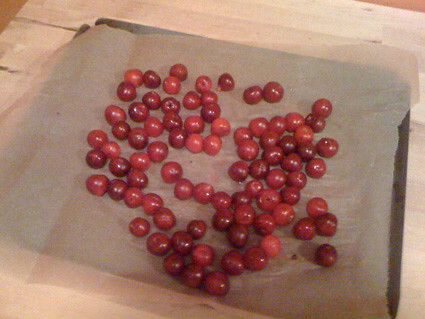 Like a smart little squirrel, I pitted my sour cherries and then popped them on to a cookie sheet lined with parchment paper. Look, I even took a picture…. I remember taking that picture before leaving for Washington, D.C., which I did on July 18th, 2010. 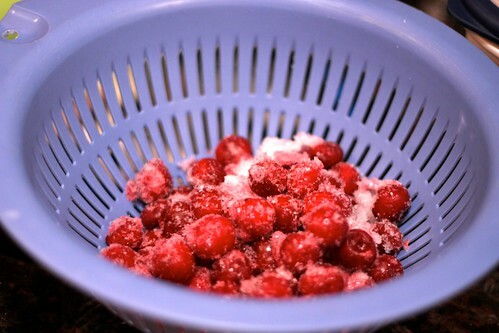 I put the cherries in the freezer for a few hours and then placed them into a freezer bag. 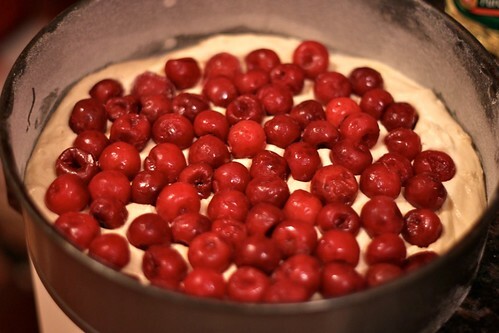 And there I was, in February, with a beautiful cupful of sour cherries at my disposal. Only one question remained. What to do with them? 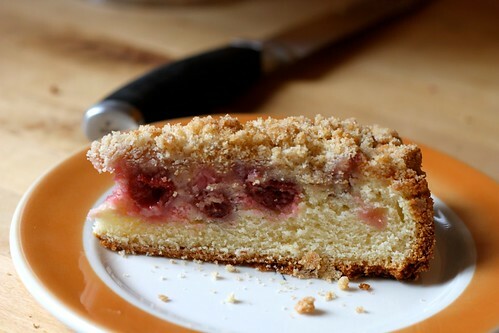 The answer appeared on a blog called Lottie & Doof: Sour Cherry Coffee Cake. 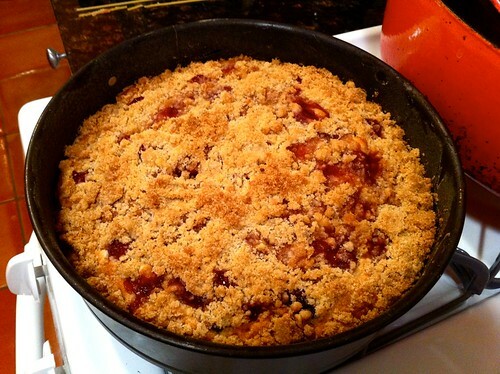 A buttery cake with a crunchy top, this would be a perfect platform to feature the tart, summery cherries in winter. And, indeed, I have to say: it was. What a dessert! Those cherries were absolutely the star. 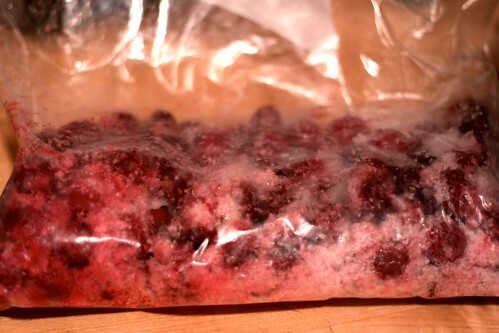 So don’t think about making this with dried cherries or some other sad substitute, like cranberries or grapes. It won’t work. Only one thing will work and it’s something none of you have. So what’s the point of this post, then? I told you. To mock you!! You are being mocked!! Don’t you hate it!! 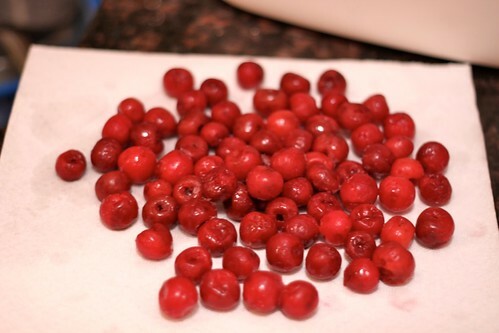 But perhaps in your hatred of me right now, you’ve learned a valuable lesson: next time sour cherry season rolls around, freeze a bunch and save them for winter. Hey don’t take my word for it, Ruth Reichl does it too! 1. 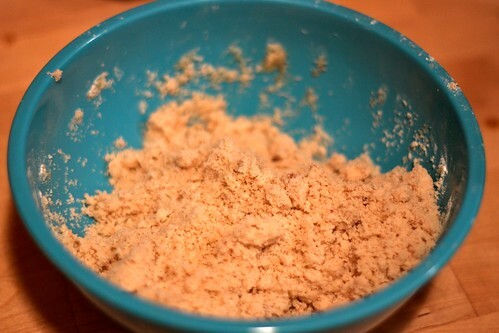 Preheat oven to 350° F. Butter a 9-inch round baking dish [I used a springform pan], dust with flour, tap out excess. 2. In a medium bowl, stir together butter, flour, sugars, salt, and cinnamon. [I used my fingers to make clumps.] Set topping aside. 3. Whisk together flour, baking powder, and salt in a medium bowl. 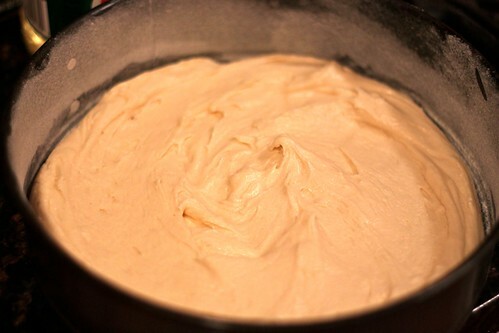 Using a stand mixer fitted with the paddle attachment, cream butter and granulated sugar until pale and fluffy. Beat in eggs and vanilla. 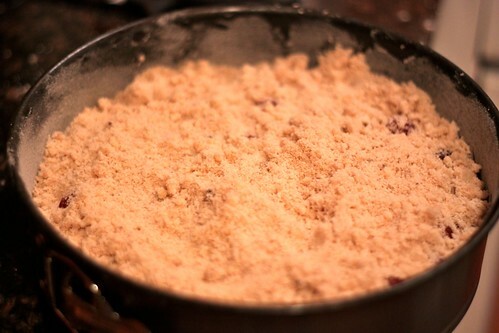 Working in alternating batches, add flour mixture and buttermilk, beginning and ending with flour. Beat until just combined. 4. Pour into prepared dish, and smooth with an offset spatula. 5. Bake until golden and a tester inserted into center comes out clean, about 1 hour.